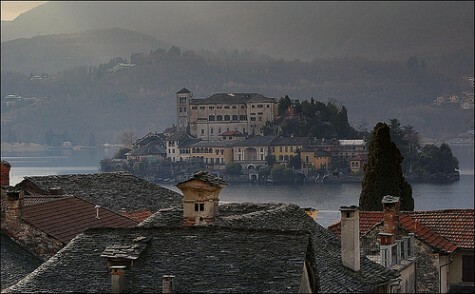 The first time I saw Lake Orta (Lago d’Orta) it took my breath away with its beauty. I think this pretty jewel of a lake is a delight. 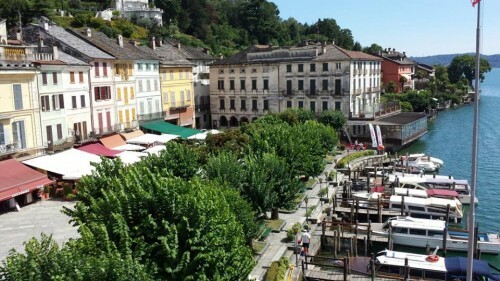 The Orta tourist board website calls this “…the most romantic of the Italian lakes” and I can see why. The setting is awesome. Everywhere you look is perfect. It will rouse you to take (perhaps even paint) pictures, stir you to write poetry and think beautiful, inspired thoughts. I first came here about 4 years ago with my mum who was visiting from the UK. We decided to come just for the day. It’s only an hour and a half drive away from Turin so a perfect daytrip from Turin. We took the A4 Torino-Milano and then left at the Gravellona Toce turn off. From there you follow the signs to the lake. Easy. I would also recommend getting there nice and early because morning at Lake Orta is probably the best time to see it. You can’t get closer to the lake than this! There’s very little between you and the water – just a narrow path and a spectacular view around every gentle bend and turn. We found this lakeside path almost by chance. After I’d parked the car there didn’t seem to be an obvious way down to the lake. It was a hot day at the end of May and I didn’t want to risk taking a wrong turn and missing the lake altogether. It’s only 8 miles long and under 2 miles wide so not so ridiculous a worry as it sounds! Thinking that it’s never a good idea to start exploring without a cappuccino we headed for the bar first. After our coffee, we asked the barista the best way down. She pointed us in the direction of a wooded area just to the right of the bar. There we saw the footpath that leads you right down to the lakeside. It takes 5-10 minutes depending how fast you walk but you need good shoes as it is quite steep and slippery. It’s cool and shady as you are covered by a protective canopy of trees. …as the sun burns off the morning mists the lake water is glittering, shimmering blue, hugged by forest green hills and protected by the soaring snow-capped Alps in the distance. Rowing boats and small motor boats bob about at the wooden jetties where the limpid green blue, softly lapping water tempts you for a swim. At different times of the day, you’ll see people sunbathing, swimming and picnicking by the lake. Magic! As you get closer to the town of Orta San Giulio you get your first glimpse of the sublime island of San Giulio (Isola di San Giulio) and as you enter the town with its Romanesque, Baroque architecture you know why this lake has inspired philosophers, writers and poets such as Nietzsche, Honorè de Balzac and Robert Browning. When we got down to the town, one of the first things I wanted to do was go over to the island of San Giulio. I couldn’t wait. It looks so pretty – this tiny island with its bell tower, monastery and what looked like a spectacular restaurant – I could see pink and red flowers cascading down from the terrace. You could almost smell their deep perfume and their colour was reflected in the rippling water below. Imagine the view from there! The only way to get across is by boat. 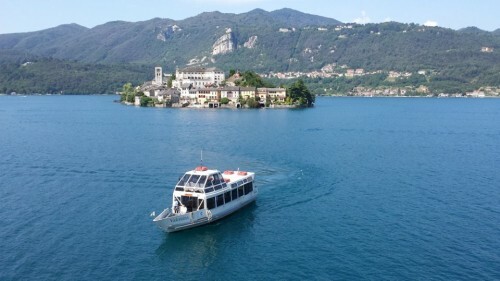 Boats go across to the island of San Giulio regularly throughout the day and prices are reasonable. The trip takes about 10 minutes. It’s only from the island that you get a true sense of the size of the monastery, said to be home to the largest convent of enclosed Benedictine nuns in the world. It’s enormous! If you turn up at lunchtime like we did you will find the church closed but you can choose to dine at the restaurant on the island and come back after 2pm when it reopens. I like quiet places but I found the silence on the island a bit disconcerting. It was so quiet. The deep silence and the cold grey stone walls of the monastery towering above us made me feel a bit cloistered myself and the island lost some of the charm it had inspired from the other side of the lake. I preferred to see it at a distance rather than up close. It was lovely though to stand in the sun near where the boats pull in and lean on one of the stone walls, looking out over the lake. Since 2001 the island has also been host to a highly acclaimed international poetry festival called ‘Poetry on the Lake’. As well as the competition in the spring, there are poetry readings, workshops, music and dance events to look forward to in the autumn. After we got back from the island, it was time for lunch. We were lucky I guess as we got a table outside, right at the front overlooking the piazza. A great position to soak up the atmosphere – and watch the queues build up for the boats as the tour groups start to trickle in. By the time we had finished our lunch there was a good wait to get over to San Giulio. I mentioned to mum that we’d done the right thing getting over there early on. Besides, it was too hot to be stuck in a queue. We spent a couple of hours just sitting there whiling the time away watching people going into the tourist shops nearby, buying gelato, souvenir t-shirts and stocking up on postcards. Our backdrop was a crowd of tall Baroque palazzos on 3 sides, their façades bleached ochre yellow and pale blue. Others dazzled pure white in the midday sun. Children played in the square and couples and pensioners sat on benches that line the promenade overlooking the lakeshore. Others strolled by. We soon noticed that we were walking against the flow as more and more tourists started to make their way down towards the main square. I suggested we walk back the way we had come – along the narrow path. So we walked back away from the crowds towards the sunbathers and swimmers and picnickers and with one last glance out over the lake, the hills and the mountains, ducked back under the trees and took the path back up to the bar. 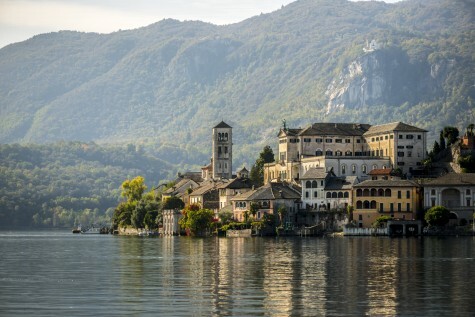 As an alternative to a day trip from Turin, consider staying overnight in Lake Orta. 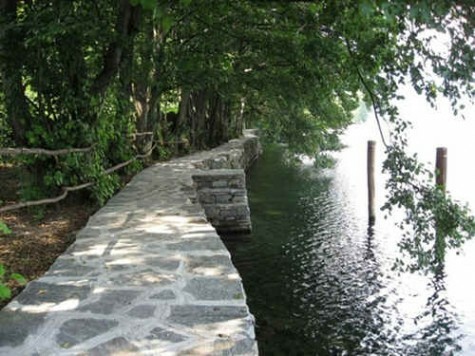 To see more of the area think about spend a few nights in Lake Maggiore too. The two lakes are not that far from each other. 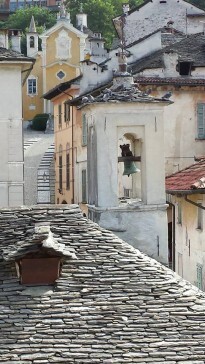 Visit the local Lake Orta tourism site for more information.